Our Baby Care Experts have created a detailed shopping list, of 8 Essential Baby Bedding buys. Did you know that if you have a big baby, she may have outgrown her Moses Basket by six weeks. 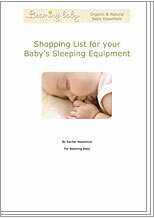 This essential baby bedding list will help you to make decisions about what bedding items you need to buy for your baby and when to start looking for them. It's fast, it's easy and it's free! Click here to find out more about Beaming Baby 's Privacy Guarantee. What to take into hospital? Baby Author and Consumer Journalist Former editor of Pregnancy & Birth Magazine, Sally Hall has studied essential baby products in great depth. Baby Essentials Expert Founder of Beaming Baby, Charlie Wynne has formulated organic baby products and developed bio-degradable nappies.